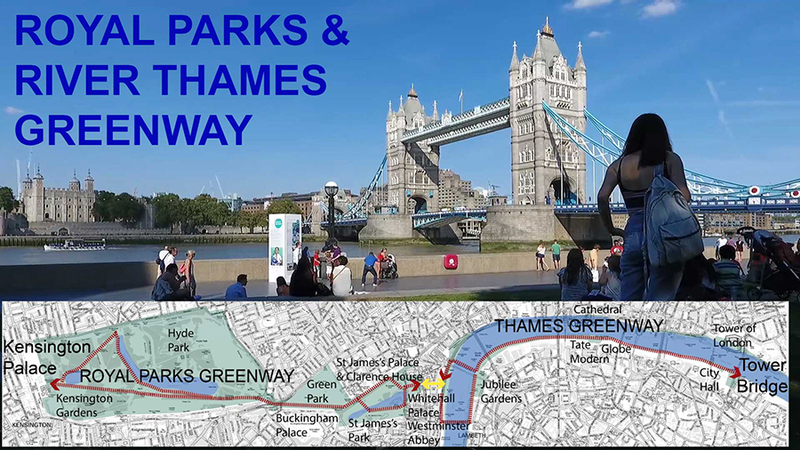 If you would like to do an assessment of the Royal Parks and Thames Path Cycle Loop, please retain your impartiality by doing the assessment before reading the post or watching the video. List of 18 London cycling posts and videos. There are a few road to cross but the only road you have to travel along is Horse Guards Avenue – and it could easily become part of the greenway. The Round Pond in Kensington ‘Gardens’ was the centerpiece of a baroque layout. There was, and is, a garden near the house but most of the area now open to the public was always more a ‘park’ than a ‘garden’. The statue of Queen Victoria is a reminder that she was born and raised in Kensington Palace. But it was the death of Princess Diana which made it famous – and led to a landscape design for re-connecting the palace with its park. Mount Walk – the shared pedestrian-cycle path- is one of the park’s historic avenues. But it lacks the ‘formality’ an avenue should have. Engineers installed rubble strips in 2016 to slow up cyclists and rattle their teeth. So most cyclists swing onto the grass – as you can see me doing. It’s time for a re-design. The West Carriage Drive separates Kensington Gardens from Hyde Park and is also part of the route of CS3 – London’s East-West Cycle Superhighway. In Hyde Park the cycle route is beside Rotten Row – which is a horse track made by King William III in the 17th century – so that he could travel in safety between Kensington Palace and St James’s Palace. It was the first road in Britain to have artificial lighting – probably using whale oil. ‘Rotten Row’ is a witty Anglicisation of Route du Roi, which means ‘King’s Road’ in French. The Serpentine, on the other side of the cycle track was one of the first examples of a man-made serpentine line in a landscape park. Hence the name. The Neoclassical monuments at Hyde Park Corner were built as a memorial to the Duke of Wellington, whose house is still here, and as a ceremonial entrance to London. Traffic engineers then moved the arch and made the place a hell for pedestrians, cyclists – and motor vehicles. Constitution Hill takes its name from Charles II’s practice of walking here to improve his ‘constitution’ – in the 1660s. The old lane had also been used by Henry VIII when, in the 1530s, he acquired Hyde Park and St James’s Park as a hunting estate. Henry should be remembered more for his open space planning than his six wives – though he did establish the park system for his own use. Constitution Hill was widened in the 1820s and became the scene for three attempts to kill Queen Victoria. It’s closed to motor traffic on Sundays – as much more of Central London should be. Buckingham Palace only became London’s premiere royal palace after the accession of Queen Victoria, in 1837. The Mall only became a ceremonial avenue in the early 20th century. It was laid out in the seventeenth century for playing a type of croquet known as Pall Mall. St James’s Palace, beside the Mall, was built by Henry VIII, on the site of a leper hospital. He liked to build a new palace when he took a new wife – this one was for Anne Boleyn. The architecture is Jacobean. St James’s Park was given a baroque layout in the seventeenth century. Then, in the nineteenth century it was ‘modernised’ to the landscape style and planted in the gardenesque style. Landscape and architecture are very well integrated and the result, in my view, is one of the best urban parks in the world. The Horse Guards Building stands on the former jousting yard – the tiltyard- of Whitehall Palace. William Kent was the original architect. It was the headquarters of the British Army until 1904, with the open space used for military parades. The civil service then took it over as a staff car park – it was know as the Great Perk. Then, in 1997, a firm of landscape architects gave the space its present dignified character. It’s still used for parades – like the trouping of the colour. Whitehall was always the main road from the City to Westminster. The name comes from England’s greatest royal palace. Henry VIII had a gatehouse built, to link his palace to his hunting park. In 1691 Whitehall Palace was destroyed by fire. Only the Banqueting House and the river steps survive. Most of the site is now occupied by the Ministry of Defence. Horse Guards Avenue runs through the site of Whitehall Palace and, as suggested in another video, should become a green street and part of the Greenway. The name Whitehall Garden is now used for a public garden designed in 1875 by George Vulliamy. It was part of Bazalgette’s embankment of the River Thames – which included a trunk sewer, an underground railway and a new road. You are scarcely aware of this in the garden – which retains its calm Victorian character. The two Golden Jubilee footbridges, opened in 2002. The architects were Lifschutz Davidson Sandilands. At 8.5 million, their annual footfall is about the same as London’s population. You can push your bike across or, if you’ve hired a city bike, you can dock it on the north side of the river and pick up another one on the south side. There are great views from the bridge and it’s a pity the designers didn’t include viewing places, sitting places and planting places. The pedestrian walk on the south bank, now known as the Queen’s Walk, was part of Sir Patrick Abercrombie’s great 1943 landscape plan for London. Until then, the riverbank from here to Tower Bridge had been used for warehouses with no public access. Abercrombie proposed what we now call a greenway – and it has been a great success. A bike can be ridden here at quiet times but at busy times you can hardly find space to walk. Abercrombie sat on the Council of the Institute of Landscape Architects (now the Landscape Institute). Coin Street has one of London’s best beaches – which isn’t saying much. The city needs an imaginative plan for reclaiming its other beaches. The river was used for bathing until 1815. It was then banned because men bathed without wearing their clothes. Oooh. The Thames beaches are now managed by the Port of London Authority. They discourage recreational use of the water, ostensibly for health reasons but possibly because making the beaches safe would cost money without generating any income for the authority. The Port Authority should engage landscape architects and should be changed into a multi-objective River Landscape Authority. The old Blackfriars rail bridge has some spare columns which, if the current project doesn’t go ahead, could be used to support a garden bridge. The Bankside section of the Thames greenway was little used when it was built but has been very busy since the Tate Modern and the Millennium Bridge were opened in the year 2000. Vogt were the landscape architects. The reconstructed Shakespeare Globe Theatre opened in 1997, after a long campaign by Southwark Council to use the site social housing instead. It cost them millions in compensation. The theatre contributes a lot to the visitor numbers on this stretch of the greenway. They could have made its surroundings more Tudor – some pigs, chickens and mud would be welcome. Clink Street retains something of the warehouse character this section of the Thames had in nineteenth century. It also has a garden on the site of the Bishop of Winchester’s 12th century palace. This full-size replica of Sir Francis Drake’s Golden Hinde has, like its sixteenth century predecessor, sailed from London across the Atlantic to the Pacific. It has crossed 140,000 miles of ocean. The present Southwark Cathedral dates from the thirteenth century and is well worth a visit. The choir sing on most days. The churchyard has an inaccurate but pleasant evocation of a medieval garden. Hays Galleria is a roofed outdoor space made in the 1980s by filling in the old dock basin and converting the warehouses to shops, offices and restaurants. HMS Belfast is a light cruiser. She was launched in 1938 and remained in service until 1971. It’s pretty grim inside but a dramatic sight from the shore. The More London district, master-planned by Foster and Partners, was shortlisted for the Carbuncle Cup in 2007. This is an award for bad architecture. But the landscape design, by Townshend Landscape Architects, has made it an attractive place to visit, with a performance area, good planting and several water features. Potters Fields, designed by Gross Max landscape architects, is an attractive green space with great views of London’s oldest surviving Royal Palace. The Tower of London was built by William the Conqueror after 1066 to subjugate the local population. Luckily, all subsequent attempts to invade London have failed. Between Kensington and Tower Bridge, the greenway goes near 6 Tube stations. So it’s easy to do the 6 mile walk in short sections. If you do it on your own bike, the return journey can be done on the East-West Cycle Superhighway. Or you can often take your bike on a train. Walkers can do an ‘Inner London Loop’ by crossing Tower Bridge and then returning via the north bank of the Thames, Parliament Square, the south of St James’s Park and the northern route through Hyde Park and Kensington Gardens. The route passes a great many cafes – and toilets. 1 Pings/Trackbacks for "Central London’s best cycle ride is through the Royal Parks and beside the River Thames"